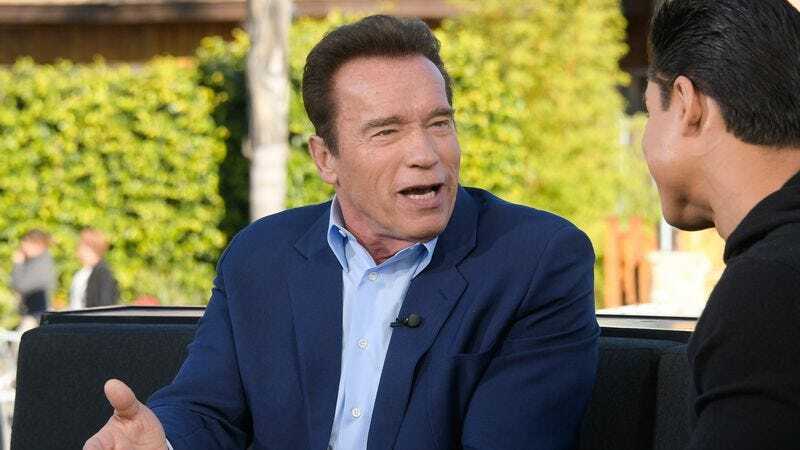 Arnold Schwarzenegger has been a Republican pretty much ever since he first came to the United States, but it was clear in the lead-up to the 2016 election that he had some conflicted feelings about Donald Trump. Though he made it clear that he did not support Trump in October, a contentious run-in with Robert De Niro in early November suggested that his convictions weren’t as strong as his mighty muscles. Then, after Trump won the election and the premiere of Schwarzenegger’s Celebrity Apprentice was on the horizon, he declared that everyone should “stop whining” and “support the president”—a position that he quickly backed down from again when Trump started complaining about Celebrity Apprentice’s awful ratings. However, Schwarzenegger does imply that he would support an immigration ban like this in general, but only if it weren’t “vetted badly” like this one was. Of course, Schwarzenegger is an immigrant, but since Austria wasn’t on the list of countries Trump is banning, it makes sense that his problem with this would have nothing to do with the fact that it’s one of the most un-American things ever perpetrated by a president. He is still a Republican, after all, and they probably wouldn’t let him keep his membership in the club if he strayed too far from the party line.